Recent Domino signing Night Moves are one the best local act to emerge from the Twin Cities since Howler, and the first noteworthy band of 2013. The Minneapolis-based, classic-rock inspired trio sound like a cross between Gram Parsons, Supertramp and MGMT, with some falsetto Mick Jagger sweet talk mixed in. 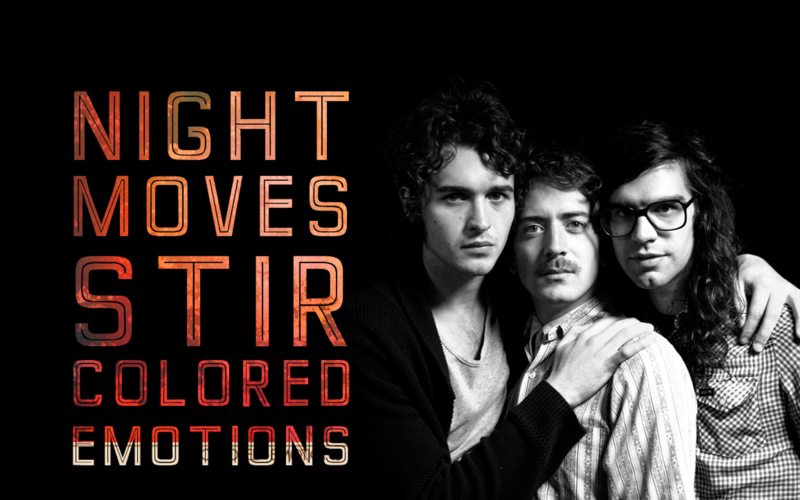 Named “Best New Band” by Minneapolis City pages, Night Moves are receiving due praise for their debut album Colored Emotions – a sleepy, electr0-psychedelic-country treasure trove of twangy, retro, guitar licks, lush instrumentation and hypnotic harmonies. The guys are going out on the road again in March opening for Django Django, hitting both coasts and cities in between. Now, they just need to quit their day jobs. DISCOSALT : Last year you posted your full-length debut – Colored Emotions – for free on Bandcamp. This year you jumped back in the studio to re-record the album with producer Thom Monahan (Vetiver, Beachwood Sparks) to give the album a “face-lift”. How is the Domino version different from the original? NIGHT MOVES : The Original version sounds a little more murky. We also completely re recorded “Classical Hearts” and swapped out “Finally Home” for “Colored Emotions”. D: How did you all meet? Was there a moment where it crystallized – you were a band? NM: We were all friends in high school. Lots of skateboarding and Music. As for a certain moment I think it just gradually happened when we realized we had similar music tastes and we all liked each other. D: The golden age of The Replacements and Husker Du may be long gone, but the local music scene in Minneapolis seems to be undergoing a resurgence lately. How is the Minneapolis music scene changing, for better or worse? NM: It seems like there’s always been music going on in Minneapolis but now some of the bands are starting to get attention. Maybe I’m just starting to get older but the only change I’ve noticed is maybe less of a punk DIY scene and more of a (punk) dance/DJ scene. But this could very well just be the places I’m going to now. D: Are there any other new DIY Minneapolis bands that should be on our radar? NM: We really dug a band called Radiator Girls but they just broke up. All the bands we play with in Minneapolis are friends of ours that we enjoy, this includes: Buffalo Moon, Food Pyramid, Moonstone, Red Daughters, and others I’m forgetting. D: What have you been listening to in 2013? NM: Well I’m listening to Wings right now, I’ve also really been digging the albums that Johnny Paycheck did for Little Darlin record label in the 60’s.